It’s safe to say most entrepreneurs don’t go into business to go broke. And when they imagine life post-launch, they probably don’t envision themselves spending hours slaving over debits and credits and the latest tax regulations. Yet all too often that’s exactly where small business owners find themselves. Sweating over financial statements and cash projections when they should be out selling new clients, servicing current clients, leading teams and building a vision for the future. Why? Because these same business owners make the mistake of thinking they’ll save money by doing the books themselves. They may think it’s less expensive to use a software program to run payroll or complete their tax returns themselves. Or they believe outsourcing to a cheap, hourly-based bookkeeping service will save them money. What they don’t realize is that these strategies can actually cost them money and that it’s far better to learn that lesson early on before disaster strikes. Furthermore, they don’t realize that an experienced, full-service accounting firm should not only help identify cost-saving practices for them but can actually help a client grow their business--- and their profits. Business owners who don’t choose to work with a reputable, experienced and knowledgeable accounting firm are probably leaving money on the table. One marketing firm, Bridges Strategies, went from doing the books internally to using an hourly bookkeeper before realizing they needed a better solution. When the partners, Ashley Quintana and Jake Fisher, engaged full-service CPA firm Ascension CPA to run their financial back office for them, not only were they able to reduce costs significantly, but they saw gross profits increase by 58% over a two year period. The partners credit Ascension CPA directly with helping them achieve this level of success. “They do everything,” says Bridges partner, Jake Fisher. Ascension oversees all aspects of the finance and accounting function including things like managing accounts payable and account receivables, bookkeeping, cash flow management, budgeting, forecasting, and tax preparation. This allows Quintana and Fisher to better leverage their time and focus on sales and growth. And it’s working. Fisher, who is primarily responsible for bringing in revenue, explains he is better able to do that because he doesn’t have to worry about accounting problems like whether cash flow is available to take on a new client. “I get up first thing in the morning and look at the numbers,” and then “I’m good to go.” If he has a question about any of the numbers, Ascension is able to clarify with explanations that make sense to non-accountants. In the beginning, Ashley Quintana did all the bookkeeping for Bridges Strategies. As the company grew, Quintana became too busy to do the books herself and the company made the decision to outsource its accounting functions. At one point during the initial search for an outside bookkeeper, Quintana and Fisher were actually ‘ghosted’ by one local service provider who just never bothered to return their calls after a number of discussions. After that experience, Quintana and Fisher, hired a large national firm, thinking surely they would get a better result. They were wrong. They describe the service as abysmal. What seemed like a deal at the outset turned out to be hugely expensive as the hours racked up each month, with no real return on investment. The accounting firm couldn’t guarantee the accuracy of its work, which should make any business owner nervous. They were slow to respond to questions or concerns yet assessed fees for every minute of their time. And they frequently allowed important matters to fall through the cracks. So, while paying an accounting firm big bucks, Fisher and Quintana still found themselves worrying about whether bills were being paid on time and they still had no clear financial picture. Quintana says she worried about finance and accounting issues “all the time.” It’s little wonder Bridges sought out another service provider. 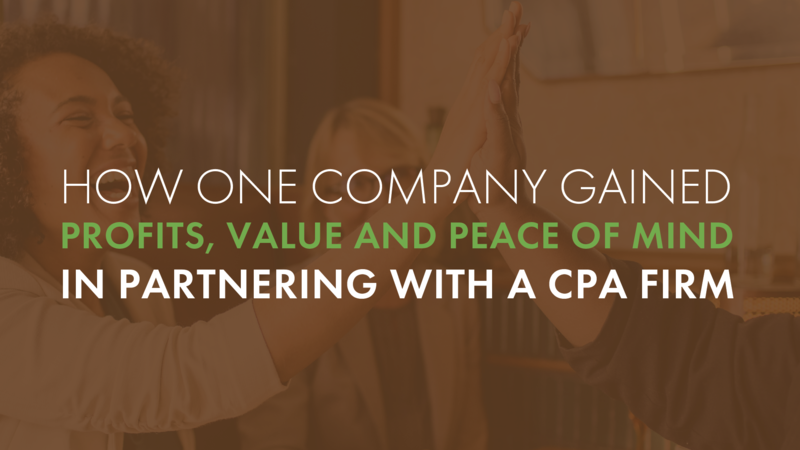 One of the many reasons Bridges chose to partner with Ascension CPA is because the partners are certified public accountants with impressive real-world professional backgrounds in both finance and business operations. CPA Cassidi Heltcel has an extensive background in operations and workflow optimization; she has helped Bridges put into place procedures and controls which Quintana says have created efficiencies leading to bigger profit margins and a more robust bottom line. In addition to tax preparation, Heltcel was able to assist with things like budgeting, forecasting and project management, allowing Bridges to streamline its accounting, operations and finance functions which has had a positive impact on the company’s numbers. Jamie Ward, who is also a partner and CPA with Ascension, has an extensive background in the commercial banking industry working as a credit analyst. Ward brings to the table the ability to advise clients on things like whether and how to manage debt to finance growth. Ward and Heltcel’s skillsets go way beyond tracking debits and credits. More and more, companies like Bridges are increasingly savvy in how they choose an accountant. They’re looking for a firm that can balance the books and provide sage business advice. Ascension differentiates itself by doing just that. “They bring tremendous value to the table,” says Fisher, because in addition to providing standard accounting services, the firm acts as a business and finance coach. Heltcel and Ward have become trusted advisors and are now an integral part of the Bridges team. Quintana calls the service they receive “fantastic,” and says she no longer worries about unpleasant cash flow surprises or whether bills are paid on time. In fact, she says she doesn’t worry about any of the accounting functions at all. Any business relationship, and particularly the one between a business owner and his or her accountant, relies on a strong foundation of mutual trust. Trust that things will be done on time and done correctly. Trust that important matters will stay on the radar until resolved. Trust that proprietary and sensitive data is kept secure. A late bill payment could mean interest charges and late fees. Bounced checks tarnish a reputation and, especially in the case of payroll and tax reporting, a mistake could cost thousands of dollars and could leave the company exposed to disastrous legal consequences. "You know how sometimes you have to trust someone with something, and you’re not sure it’ll be up to par with what you’re expecting, so you say ‘I’ll just do it myself?’ I don’t ever have that worry with them.” Quintana says she’s able to concentrate on running the business, knowing the books are in good hands. “There aren’t any surprises, and I’m not ever concerned about anything." Quintana says, “The numbers and the growth speak for themselves,” but the other thing she finds appealing is that Ascension charges a flat fee. Other firms charge by the hour and, understandably, many business owners think, “Great! I’ll only pay for the time use!” But that’s not actually the case. Paying by the hour often means you’re financing an accountant’s learning curve. It’s counterintuitive, but the less an accountant knows about a subject, the more you’re likely to pay. If an accountant has to spend hours researching something or takes longer to perform a task because it’s unfamiliar, the more hours appear on your month-end bill. Businesses like Bridges Strategies want to pay for knowledge, experience, and expertise, not for the number of minutes it takes a worker to complete a task. And if an owner wants to shoot an idea past their accountant, they may think twice before picking up the phone if they know they will be charged for every minute. A flat fee allows the accountant and their client to form a relationship over time, without having to keep one eye on the clock. When they partnered with Ascension CPA, Bridges Strategies increased gross profits by 58% in two years and added significant value to the business as reflected on their enviable balance sheet. Do you really want to step over that same possibility for your company in favor of a DIY solution or calling a cheap hourly bookkeeping service to save a few dollars now? It’s safe to say, that’s a no-brainer. We’d like the opportunity to become a trusted advisor and help you take your business to the next level. We invite you to fill out this form on our webpage or give our office a call at (405) 759-2796.